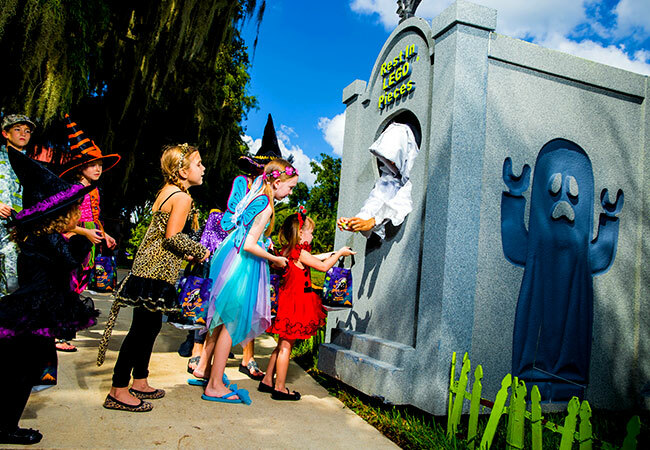 Lurking around town for some not so scary Halloween events in Orlando? 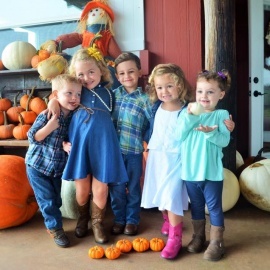 Living in the city of Disney theme parks and endless family-friendly attractions in Orlando does have it's benefits especially when you have little ghosts and ghouls who love fall as much as you do. What's not to love after all. It's the beginning of the holiday season where costumes are encouraged and candy becomes part of the food pyramid. Before you think we've hopped on the Orlando theme parks bandwagon...or in this case, hayride, we've crafted a list of kid-friendly Halloween events in Orlando including some that won't cost you an arm and a leg. Trick-or-treat at the wildest place in town during our annual Zoo Boo Bash! It’s a safe, fun, and not-too-scary event for creatures of all ages. Bring your treat bag and wear your costume for a wild time on Oct. 20, 21, 27 & 28. The annual Brick or Treat event returns with spooky, kooky LEGO fun for kids, but this year with more days, more entertainment and more candy than ever before! Select dates Oct. 6th - 31st. Join us at Waterford Lakes Recreation Center for the 3rd Annual Wilkins Way Trunk or Treat on October 28th from 3pm-6pm. We will have trick or treating, food, music, bounce houses, raffles, and much much more. The event is FREE to attend. Be part of The Animal League's Halloween tradition - the annual Howl-O-Ween Pet Parade located in downtown Clermont, Florida. Prizes will be awarded for various categories and all proceeds benefit The Animal League. 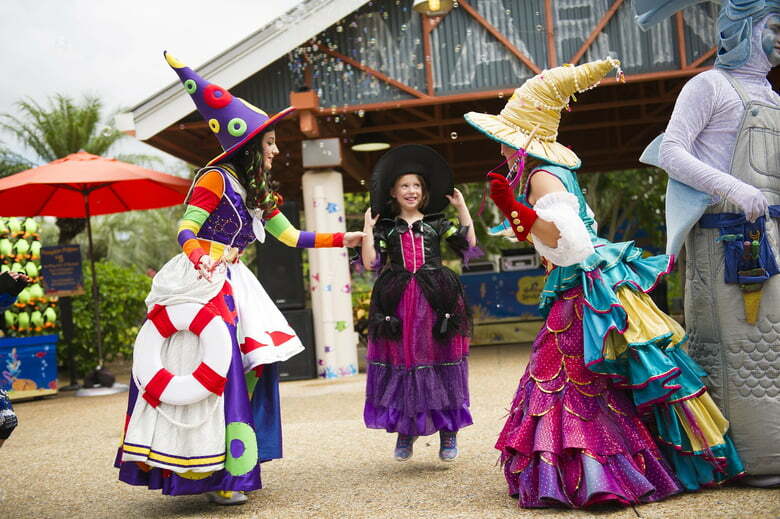 It’s an ocean of Halloween fun for the whole family at this year's Halloween Spooktacular at SeaWorld | Orlando. Families are immersed in an underwater "fantasea" including trick-or-treating, whimsical sea creatures, and more in this family-friendly event that could only come from SeaWorld. The event runs weekends, September 22 - October 28, 2018 and is included in park admission. Back again in 2018, it’s the happiest haunting on Earth! Don’t miss your chance to collect candies, all while the park hosts eerie entertainment and Disney Characters that go bump in the night. Best of all: since the tone of this event is “not-so-scary,” that means children of every age can enjoy the fun! Select dates now through October 31st at Walt Disney World. Screamin’ Green Hauntoween is back September 22– October 31, and it’s bigger and more colorful than ever! Get ready to get ZOMBIFIED with all-new monster-ific crafts and special, spooky happenings all month long! Bring the entire family for a costume party featuring Tim Burton’s Frankenweenie! Before sitting down to enjoy the film, dress your ghouls in costume and join us for a deliciously spooktacular lunch, games, and fun the whole family will enjoy. BOO! on Broadway is a family friendly event. Bring the kids out for an evening of trick or treat fun, vendors, games, pictures and plenty more on Oct. 26th on Broadway in Downtown Kissimmee. Orlando is filled with so much kid-friendly fun it's almost scary. Check out our Orlando Halloween guide for a full list of fall events and things to do in Orlando on Halloween.